Choosing a salon is not easy and maintaining a great relationship with your stylist can be even more challenging. Too often clients do not know the best way to communicate with their hairstylist or salon. Sadly… our beauty industry is sometimes driven by big egos and less than friendly front desk staff. Clients need to first consider that they are choosing a salon to do business with, that employs a great team of hair stylists. Clients then can select members from the team of stylists to perform their services. It is a common misconception that clients must find a stylist first. The reality is …. Clients must select a great salon that employs great stylists. The two go hand in hand. Here are five simple questions you can ask to find a great salon and great stylists. How many educational classes has the salon and the stylists had within the last 12 months? If the answer is less than six classes… You need to seriously rethink your relationship with the salon and stylist. Our beauty industry changes so quickly. Styles and trends change monthly, weekly and yes even daily! The amount of education that is available to salons and hairstylists today is incredible. There are thousands of classes available each year. Great salons and great stylists research classes available to them and take as many of these classes as they can. 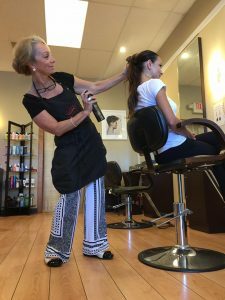 Watching educational videos on YouTube is a helpful tool, but it cannot take the place of being in an advanced class with 25 to 30 other stylists from around the country. These classes are taught by national educators and this knowledge can be brought back to the entire salon. Are you going to consult with me before you start working on my hair…. each and every time? Are you not going to say “Same as last time or the usual” like your ordering at the diner? When you go to a salon… you are paying not only for a great cut and color, you are paying for their expertise. Salons and stylists need to offer clients the latest new styles as well as options for styling. If you receive a new style, it is the stylist’s obligation to show you how to create the salon look at home. If you walk out of the salon looking like a million dollars, but you have no idea how to duplicate that look at home, you did not get the full experience. Great stylists and salons know the importance of recommending products to use at home. They understand the importance of teaching their clients how to duplicate their style just like they left the salon. Are you going to provide me with an exact price for all my services or will I get the final price at the time of check out? Too often clients are given the industry’s “Dump and Run” … where a stylist walks the client up to the front desk and runs away… as quickly as possible while guest care announces the final price. Great salons and stylists know the importance of providing prices to clients, before they start each service. They realize that there are options and price points to achieve the look a client wants. Is it ok for me to see different stylists at your salon? Too often the answer given is yes… but when you try other service providers the situation becomes uncomfortably weird. It’s unfortunate, but true that many salons and stylists frown on switching between stylists. The good news is that this is not the case with all salons and stylists. Find a great salon and great stylists who know it takes the entire team to take care of their clients. When a client can use the entire salon team to take care of them, they have so many more options. What happens if I don’t like the cut or color you provided me? Are you going tell me to go home and live with it for a few days…. see if I like it? Are you going to charge me an outrageous amount of money to fix or redo my hair? Great salons and stylists understand that all clients have to leave loving their hair. They’re going be walking around with the cut or color for the next 6 to 8 weeks. Find a salon and stylist team that 100% guarantees all of their work and fixes any redo’s for free. If you ask these five questions, I can guarantee you will have a great salon experience and your hair will look fabulous!